If you don’t already have Avast, I recommend it. It is free and it works well. 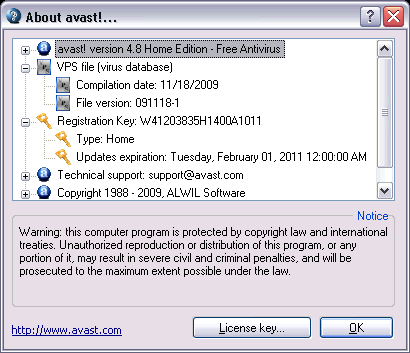 The free version can be downloaded from the Avast website. The following instructions are for version 4.8. 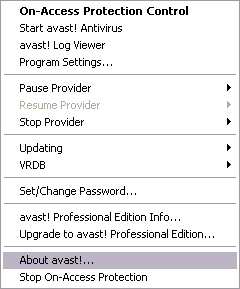 The currently available version of Avast! 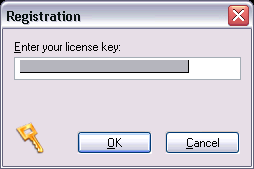 is now 5.0 which the instructions for installing the license key are a little different. Those instructions are coming soon. If your Avast! Antivirus subscription is expiring soon, here are the instructions to renew it for free. 1) Obtain a license key. You can get it free from the Avast website if you give them your email address or contact me if you want my help with that part of it. Don’t worry, your email address is safe with Avast. They won’t spam you. 2) Right-click the “a” icon in the system tray (lower right corner of your screen). 5) Type or paste the previously obtained key.